As you can probably imagine, our Game Operators see a lot of weird and wonderful things happen when running games for our lovely customers (some stories a lot weirder than others!). 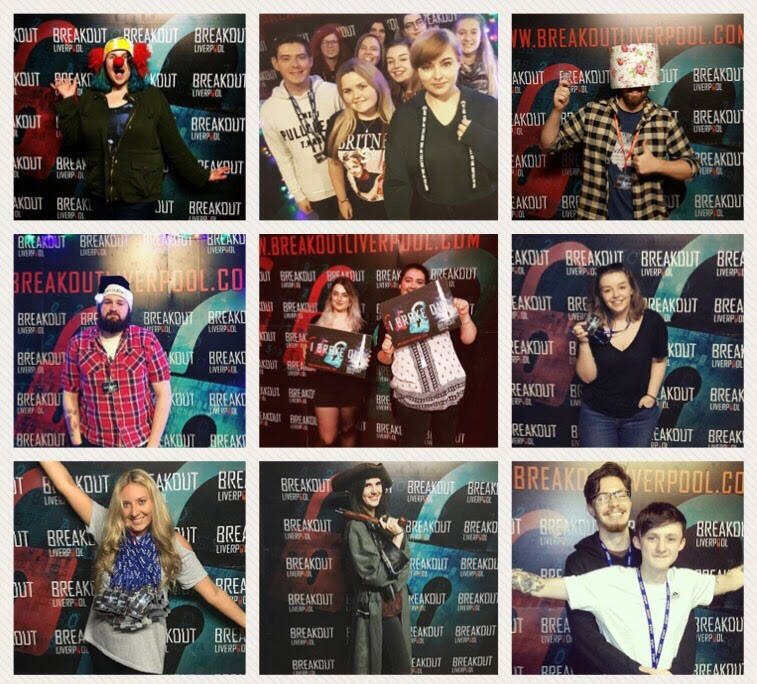 This blog will feature stories across our Breakout Cardiff, Breakout Liverpool, Breakout Manchester and Breakout Chestersites, and will provide you with some insider information as to what really goes on in our rooms behind closed doors. We will start with the most 2017 that happened to us: “The year of Facebook Live” story. As Game Operator Shannon was congratulating her group on escaping, one of the customers pulled out her iPhone and went live on Facebook. This then led to all of them celebrating with Shannon to every one of her friends on Facebook! Another story of which encapsulates the millennial era yet again revolves around technology. One Game Operator accidentally left her phone within the room after resetting, and the team became fixated with it (despite being told to put it to one side!). The customers tried to unlock the phone so many times that the Game Operator was locked out for 2 hours once she retrieved it after the game had finished. Next, we move on to one of my favourites from the selection of stories. Game Operator Jake had a customer struggling on one of the puzzles. She was struggling that much, she proceeded to take her phone out of her bag, and call her Mum to ask her for the answer to the puzzle! This was the first time he’d ever seen this happen after working here for over 2 years! Recently, we also had a man randomly strip down to his boxers whilst playing the game. We were wondering what on earth he was doing, until he ventured over to the wardrobe in the room and got dressed up in the suit! At the end of the game, he then stripped back down to his boxers without warning to get back into his everyday attire. Another common problem we Game Operators encounter are teams coming to play Classified 2 after playing Classified 1, not realising they’re identical in content! One team decided to go ahead and play Classified 2 anyway, and managed to blitz through the whole room in about half an hour (which, if they hadn’t played before, would be a record-breaking time!). Customers not only do hilarious things, but say hilarious things, also. A team once insulted the person on the policeman ID who they were looking for in the room, not realising it was the Game Operator who was doing their briefing! This incident happened fairly recently, but funny situations have been occurring since Breakout first originated. Within the first six months of the company opening, the now National Manager locked herself in one of the rooms without a phone. She didn't know how to complete the room, so resorted to reverse calling the office with the mobile phone that was in the room. In order to do this, the office would have had to accept the reversed call, but the office kept declining it. Her team turned up on time and had to wait 20 minutes as she was locked in the room. Eventually, someone noticed that she'd gone missing and saw her waving at the cameras in the room. She was finally rescued, but her story still remains hilarious even to this day! Time for our celeb stories! We have been lucky enough to be visited by the likes of comedian Sarah Mulligan, GMTV star Ben Shephard, Welsh rugby player Gethin Jenkins, pop star Pixie Lott and Manchester United players Rashford and Lingard. In addition to this, Daniel Sturridge, James Milner and Joe Allen from the LFC team put their brains together to try and tackle our secret agent themed room. This experience involved a lot of dancing from Sturridge after opening padlocks and completing puzzles! Speaking of fun dancing stories, we once had a family bring their grandmother down to play one of our rooms and, after every padlock she opened, she proceeded to do the Macarena! Everyone please bear this in mind, we would LOVE for every customer to do this after opening a padlock! Now this story has got to be the funniest of them all! The office had ordered a Chinese takeaway for the evening and we were expecting the delivery at any moment. As the delivery driver walked down our stairs, a group escaped from a room and started celebrating. The delivery driver then began to start celebrating with the group. We think he thought they were the ones who ordered the food and they were celebrating because he had arrived! Since we’ve been on a journey of ups and downs we will end on a very positive note! Our favourite stories are the proposals!! We’ve had roughly around 20 proposals across all of our sites and we love seeing couples leave happily knowing they will be getting married in the next few years (although we are still waiting for an invitation to one of these weddings!). We welcome any further proposals in the future, so please feel free to get in touch if you’re looking to propose in one of our rooms! We hope you’ve enjoyed reading through this blog, and we’d love to hear your personal funny stories, too! Please tweet any funny stories you may have over to @breakoutlpl, @breakoutcardiff, @breakoutmcr or @breakoutchester!